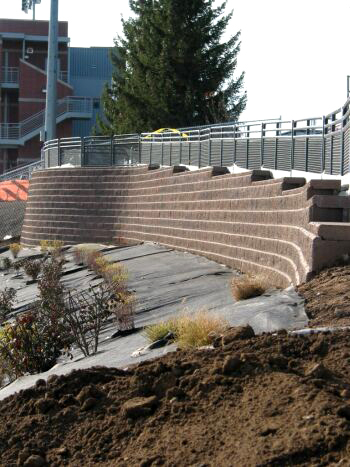 Eastern Washington University has chosen the Allan Block Classic and Ashlar System for the majority of their retaining wall needs. They have done a lot of installations themselves and have trained their employees to become Certified Allan Block Installers. The color used is Redrock Blend. 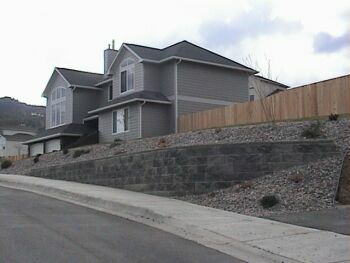 Interlok Systems installed these walls in a neighborhood on Missoula's South Hill area. 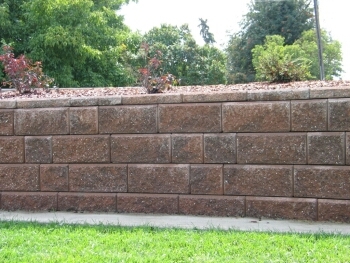 He used both our Shadow Blend and Redrock Blend colors. 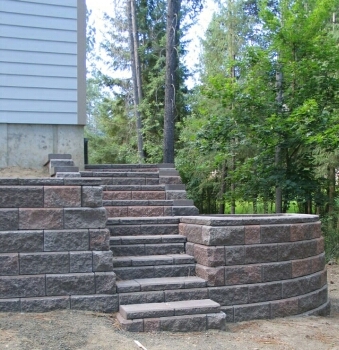 This stairway was installed by the homeowner. 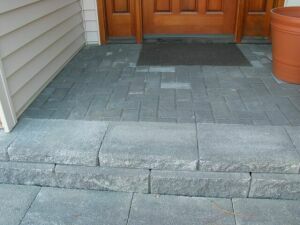 After a lot of planning and measuring, he was able to create this attractive entrance way to his home. 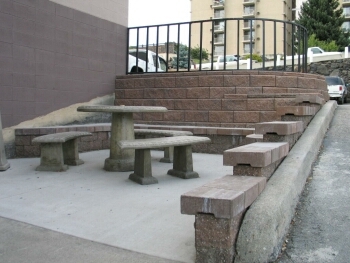 The update to the landscaping at Associated Industries included some retaining walls and a new patio space. 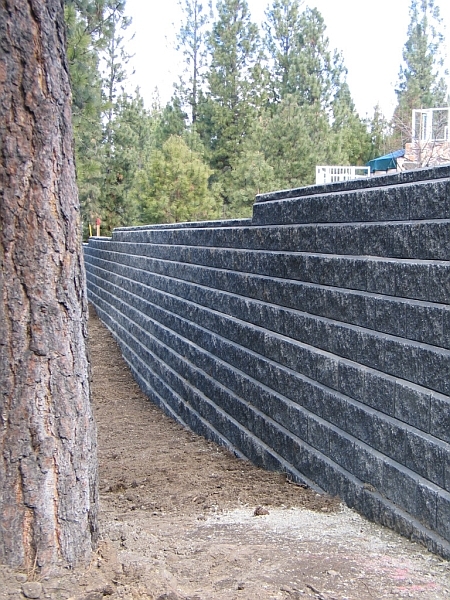 Leon Williams of LJ Will Build 4 U, chose the Allan Block prodcut line because it offered a solution for all the onsite upgrades in one product line. 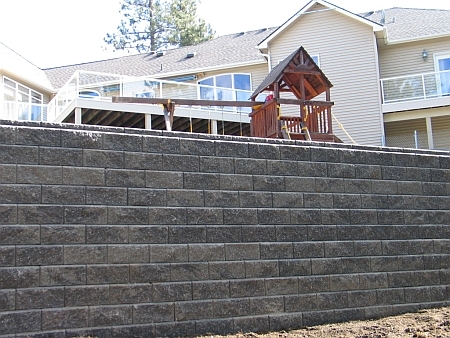 With matching colors in both the Courtyard and Retaining wall Blocks, it offered the color consistency that the project owner was looking for. 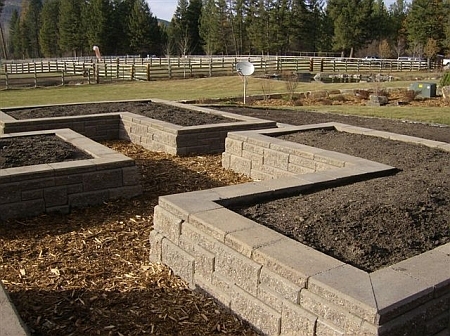 The customer need to update and raise the garden planters in their yard. 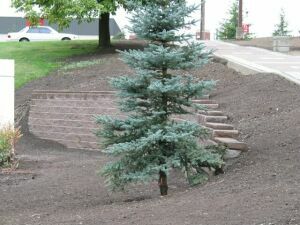 They wanted something unique and Mark from Majestic Mountain Landscaping delivered. 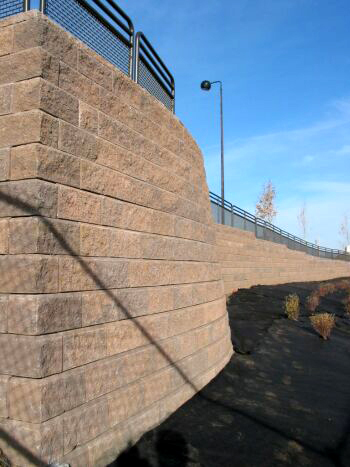 Using the AB Ashlar block in our Walnut Blend color, he was able to create a design that fit the bill. 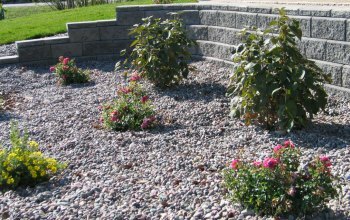 This company was looking to expand their nursery business by adding more hardscape materials to the product line. 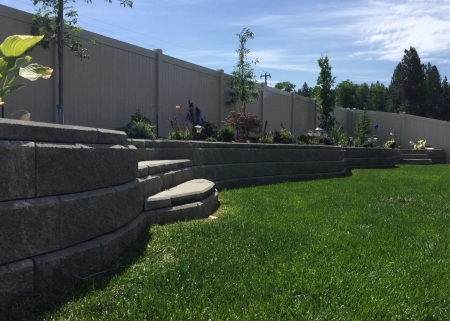 They redesigned part of their yard to incorporate a variety of Allan Block products. 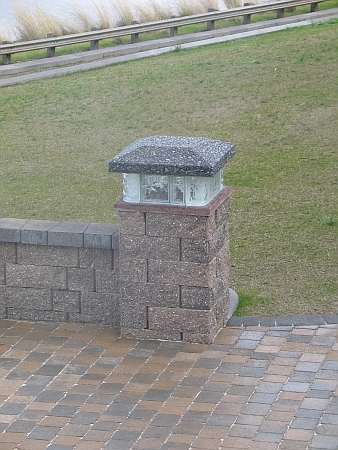 They have used AB Jrs, AB Three, AB Classic, AB Ashlar, Corner Blocks and some of the Courtyard Products. 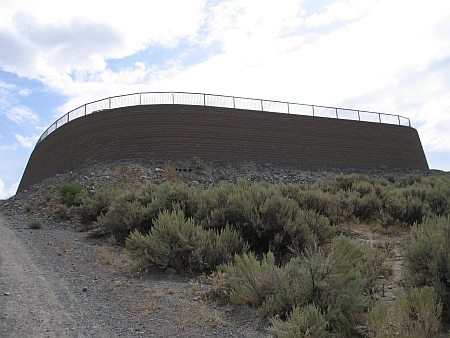 After many years maintaining a sloping hillside, EWU decided to build a terraced wall. 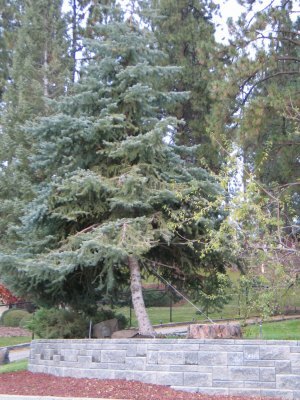 The hillside had erosion problems in heavy rains and was not very hospitable to plants. 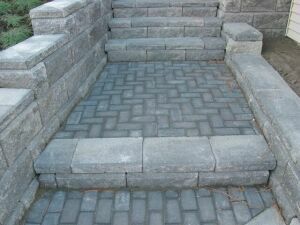 Terracing was a good way of adding plantable space, and breaking up the wall because of the height. 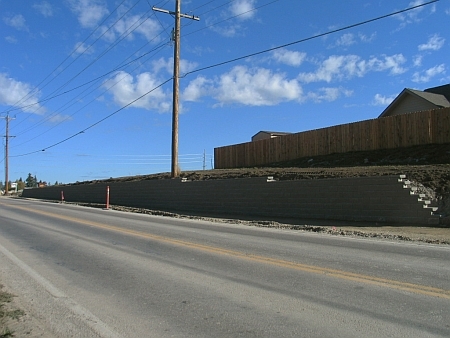 This project was out for bid in late May of 2004. 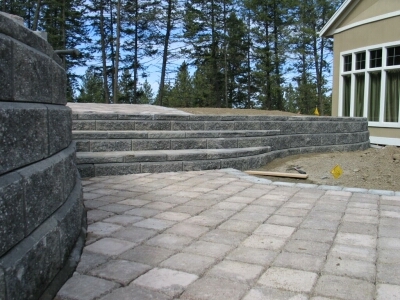 A.M. Landshaper bid this project as the General Contractor / Landscaper and was awarded the project. 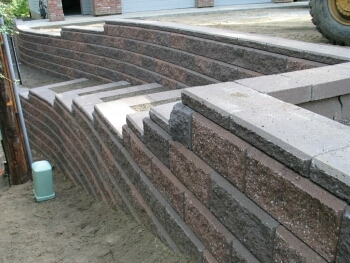 A.M. Landshaper has been a Certified Allan Block Installer since 2001. 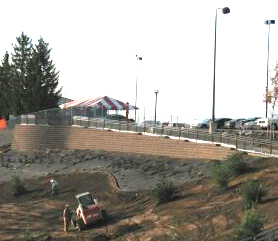 A.M Landshaper is wrapping up the project. 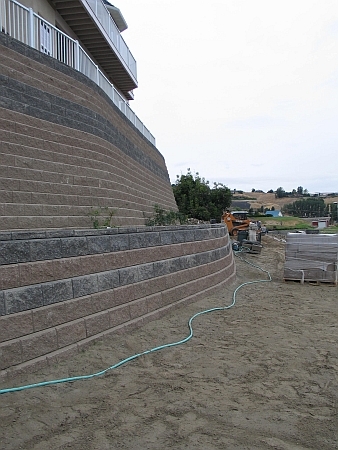 All of the Allan Block Walls are completed, pavers are installed, concrete is poured, plants and vegetation are placed and the rock mulch is being installed. 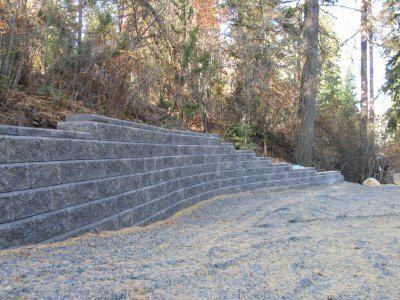 To level out the driveway to the garage, the AB Classics were used to build up and retain the fill material in heights up to 22 feet tall. 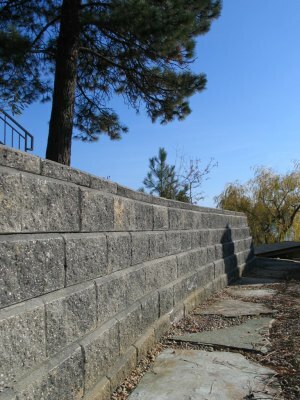 The wall was originally specified as a concrete poured in place retaining wall, but the owner wanted something more than just a plain gray finish. Not to mention that the cement shortage was beginning to affect our region. The AB Classics are a great solution. 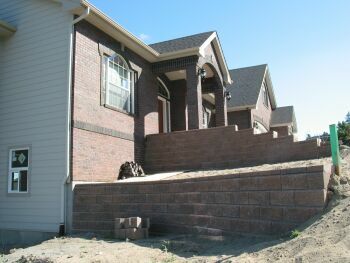 Not only was the overall cost of the project less expensive than the poured in place option, it offered the owner a more aesthetically pleasing wall. 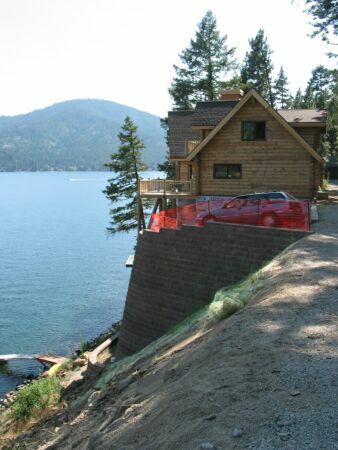 The views overlooking Hayden Lake are spectacular and from the lake the house looks great too! 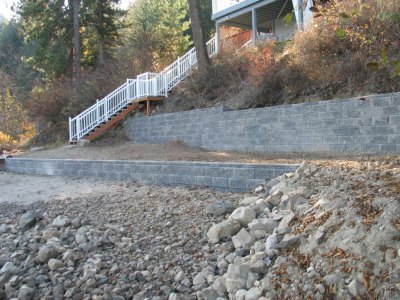 These are pictures from 3 different jobsites that Ian and his crew worked on over the past year. 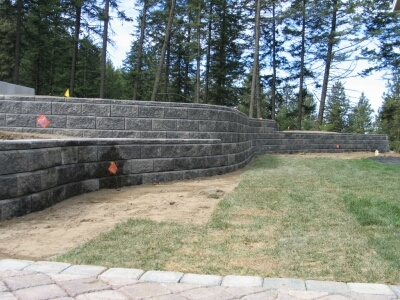 More jobsite pictures from Custom Sprinklers & Landscaping. 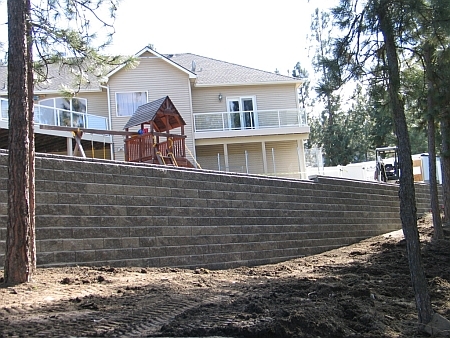 This project required the retaining wall to be built and the ground back filled and compacted before the construction of the house could take place. 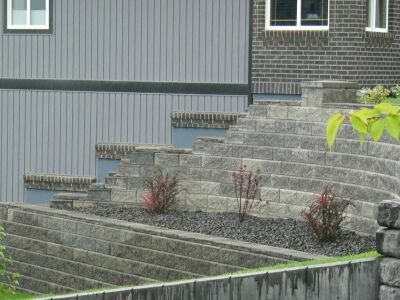 Jeff Cornish with L-C Lawn & Landscape came up with the design for using a different textured retaining wall block on top of the Allan Block wall to create a unique look. 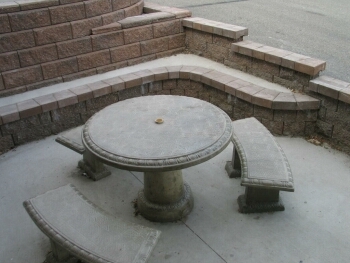 The contractor used to AB Courtyard to define the patio area for the hjome owner. 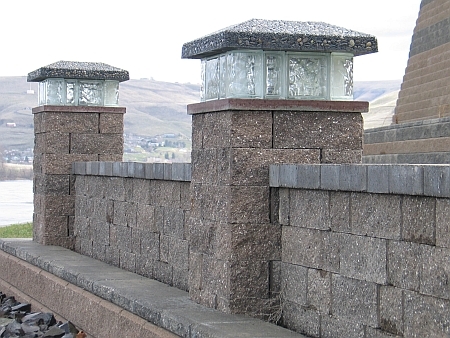 Te AB Courtyard posts with glass block and lighting create a great ambiance wen entertaining. 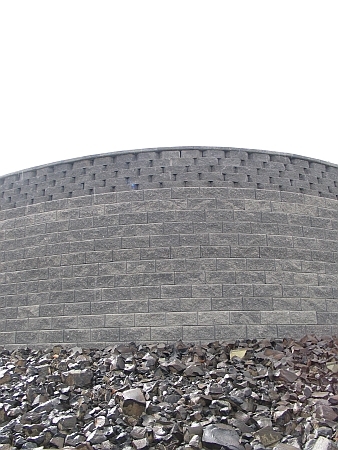 The AB Courtyard walls also create privacy from the road below as well as a little bit of noise reduction. 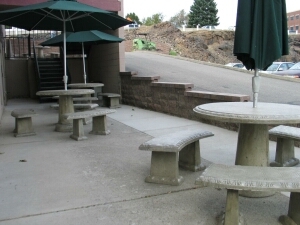 More pictures of the AB Courtyard project. 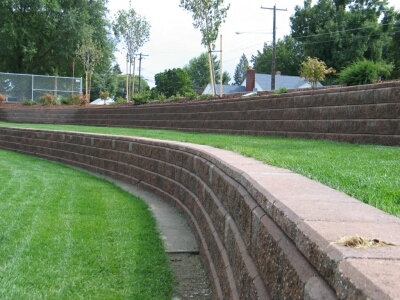 The Allan Block Retaining Wall was built first. 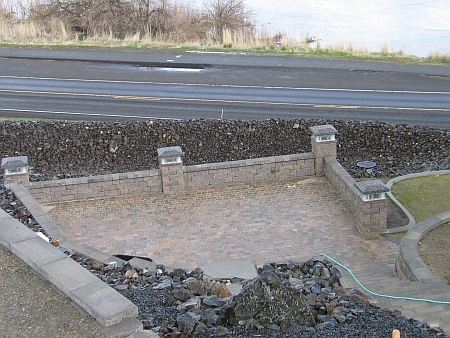 At that point they realized the need to define and enclose the patio area due to the roadway below the property. 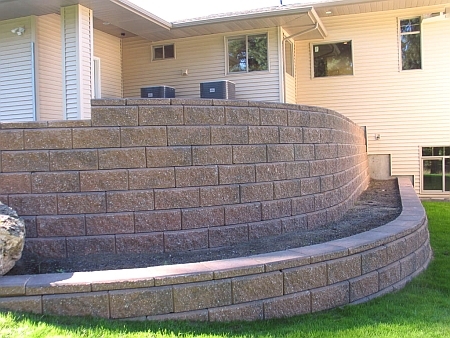 Jeff used the AB Classic in Tan with Shadow Blend for accent stripes in the wall. 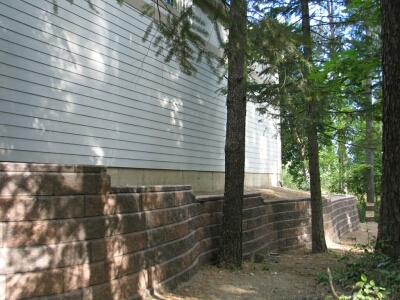 The wall was built in front of the basement walls. 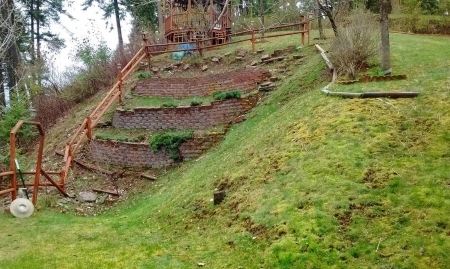 It gave them a little extra yard at the main floor level. 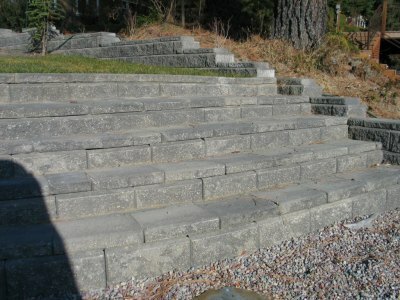 The Allan Block can also be used to create stairways! 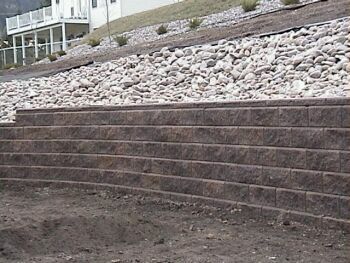 Rick used a blend of our Kaluah and our Red Rock Blend to create this unique retaining wall. Creating step ups as the grade changed is always a challange. 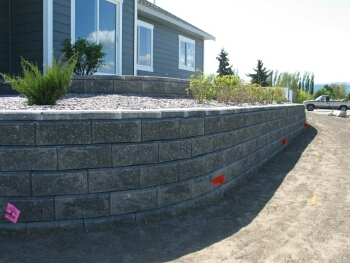 But for Rick, a Certified Allan Block Installer, it was the right solution for the project. 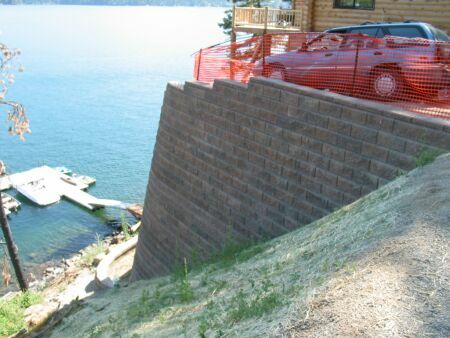 Creating steps in the wall takes patience. 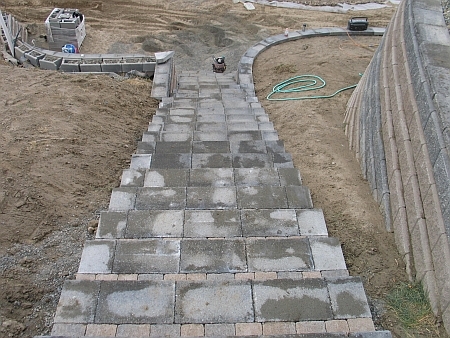 Pride in their work is what makes a great set of stairs. 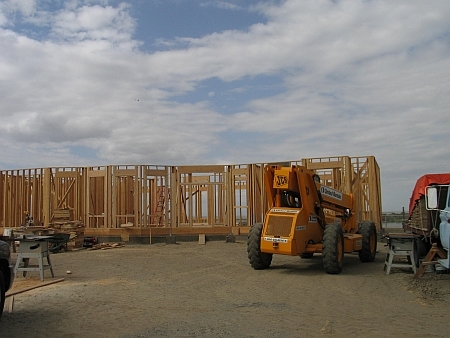 This is the third phase of this project for the homeowners. 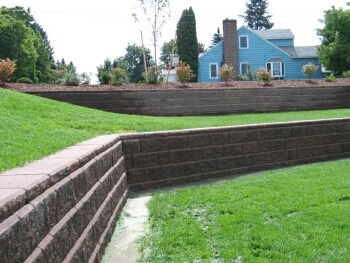 They had Real Escapes build some retaining walls to give them a little more usable space both in their front and back yard areas. 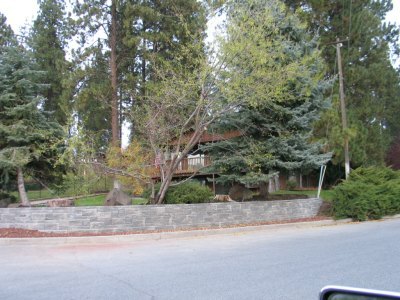 The structural Allan Block wall was built to replace a failing landscape wall on the homeowners site. 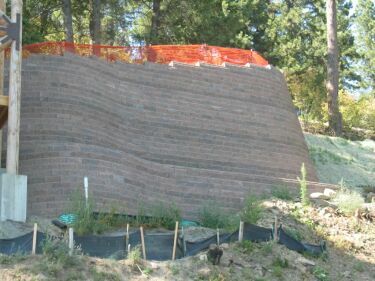 The original block were way undersized and did not provide enough mass to hold up the pressures of the hillside. 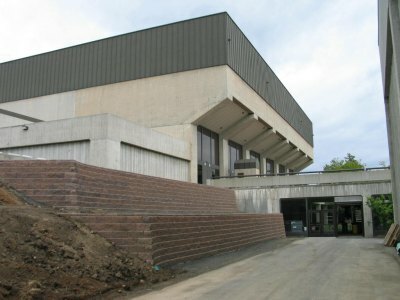 The 3 terrace Allan Block design was implemented to break up almost 15 feet of grade change from the top to the bottom. 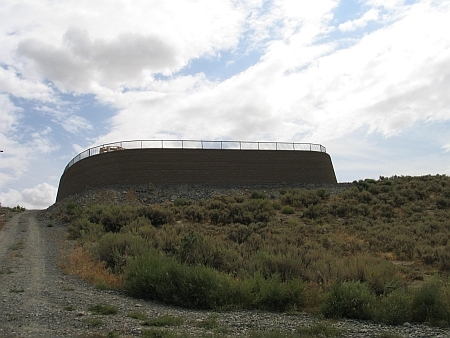 The use of geogrid was required to create a composite mass able to withstand the pressure loads from the hillside. 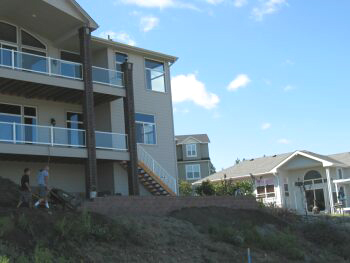 It allowed the homeowner to later put a garden area in at the 1st terrace and plants & flowers in the 2nd. 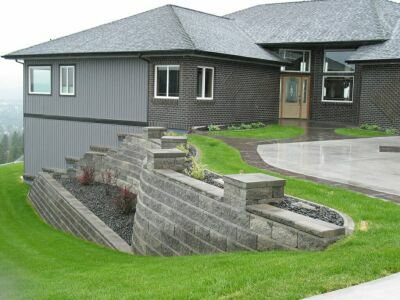 The home builder need Mark to tier the landscape to create more usable space. 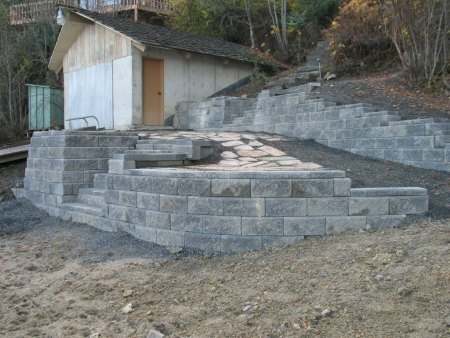 Mark used the Allan Block Classic with a 6 degree setback to create the needed space. 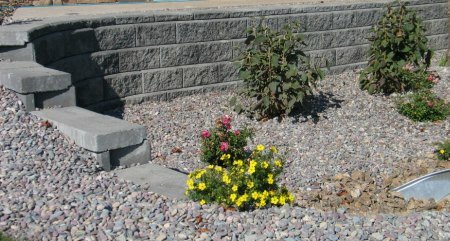 The Shadow Blend color is a great accent to the plants & gravel mulch. 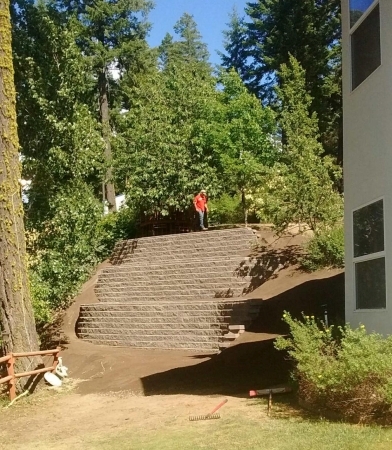 The homeowner needed to replace a 6' tall timber retaining wall that was rotting & collapsing. With 2 young children at home, it was also a safety issue. 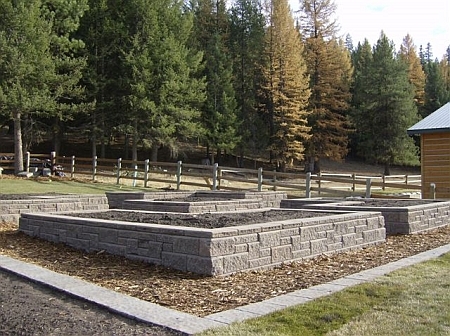 Rick used our AB Classic 6 degree set back in our Shadow Blend color to replace the rotted timbers. 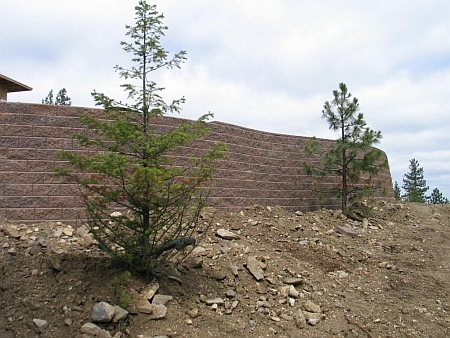 He used lengths of geogrid behind the wall to reinforce the soil as he built up the wall. 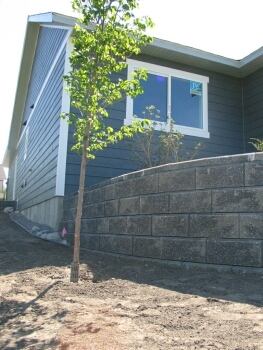 The homeowner chose the AB Classics and AB Juniors to take care of there retaining wall needs. 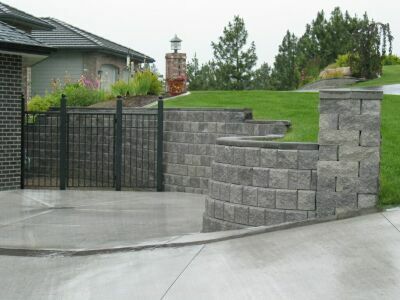 They also used the AB Courtyard System to create Posts that accent the retaining walls. 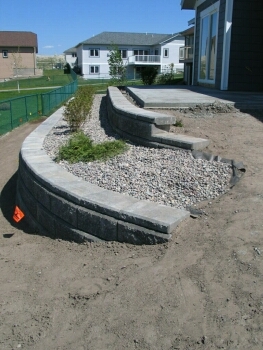 Hard Rock Stone Company had landscaped the owners previous home and was selected to landscape the new home. 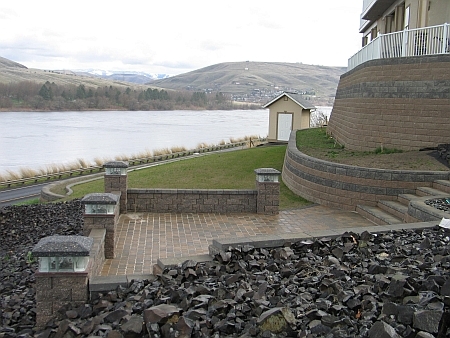 They had used the Redrock Blend before and thought it would work well with the Cultured Stone color they had chosen for the house. 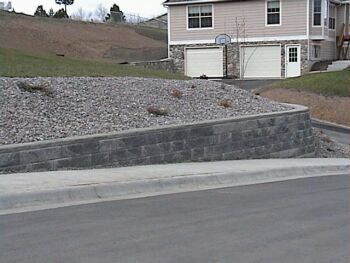 A nice wall for an impressive landscape. 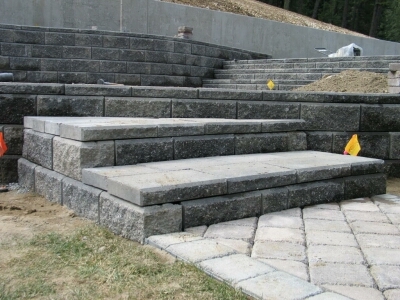 Rick chose the Allan Block Classic 6 degree set back to build the walls for this project. 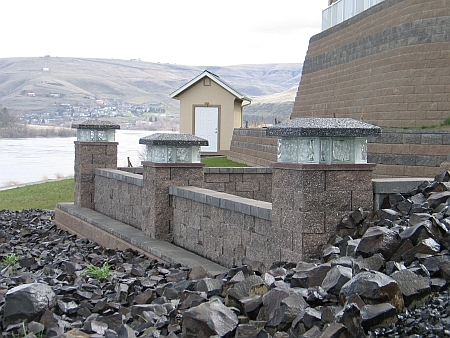 Our Shadow Blend color provides a nice contrast to the surrounding landscape. 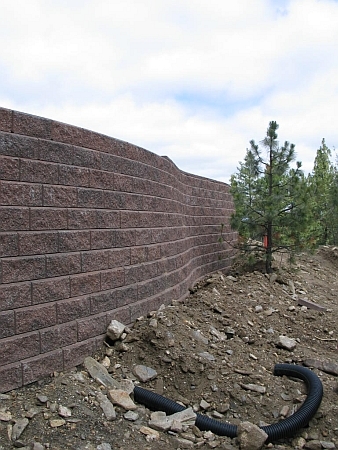 More Pictures of the Allan Block Retaining Wall by Real Escapes by Rick Hamilton. 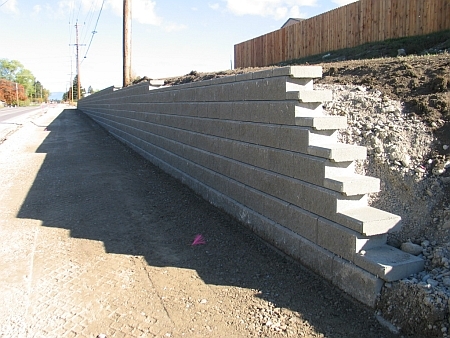 Rick's crew used the Allan Block 90 degree corners whenever the top of the wall stepped down to follow the grade. This is the Top Dog. She was always on top of what the contractor was doing! She made sure that the AB Wall was being built to the proper specifications. 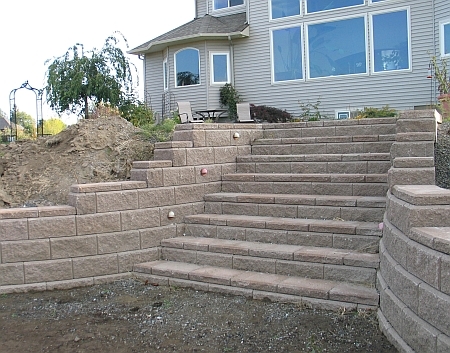 These unique steps were built using the Allan Block Jr. in our Tan color. 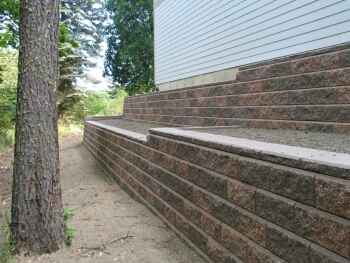 The steps are in the middle of a Allan Block Classic 6* wall and had a tight raduis. 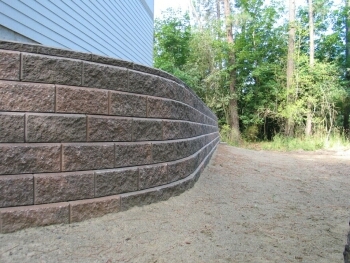 The AB Jr.s were used to meet the requirements of the curves and blended in nicely with the rest of the wall. 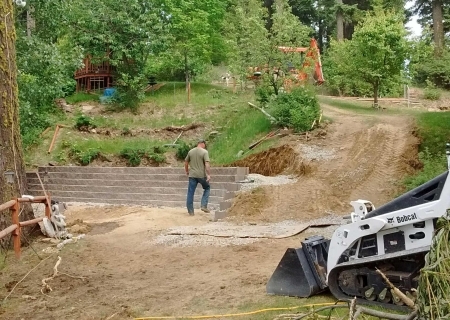 Jason & Mat with Valley Landscaping had the task of replacing a dilapidated metal bridge and concrete pathway that meandered from the hotel, looped down by the pool area, then out to the Centenial Trail pathway at Riverfront Park. 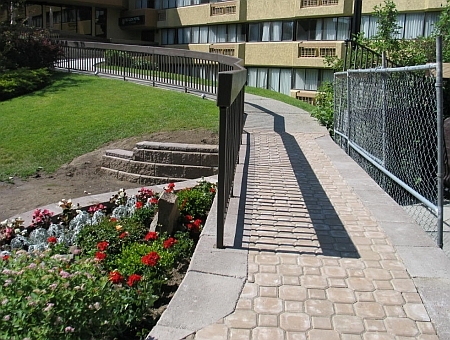 They used the Allan Block Classic Tan to create a double sided retained area to create the new paver pathway in place of the old bridgeway. 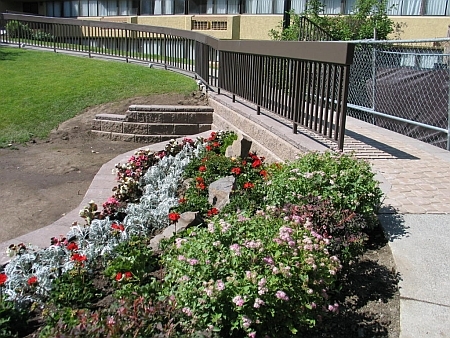 They had new hand rails manufactured and grouted them through the top caps down into the top 3 rows of the Allan Block to create stability. 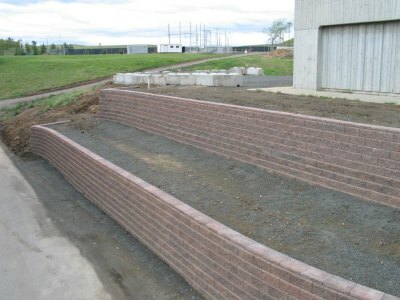 To soften the new pathway, they created little planter areas in front of the new wall, which turned out to be a great addition to the project. 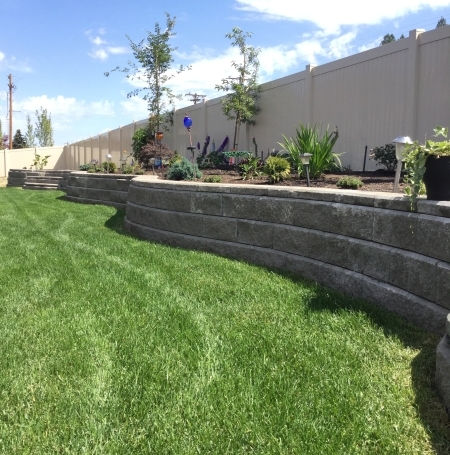 The owners wanted to create more usable yard space on their property and using the Allan Block Retaining Wall System helped them do that. 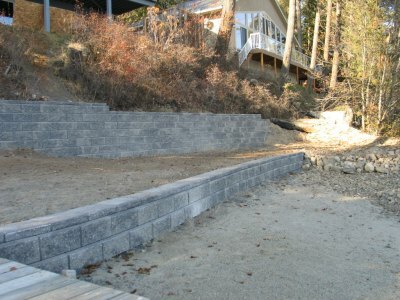 Rick and his crew built these walls within a few days and dramatically changed the landscape surrounding the home. 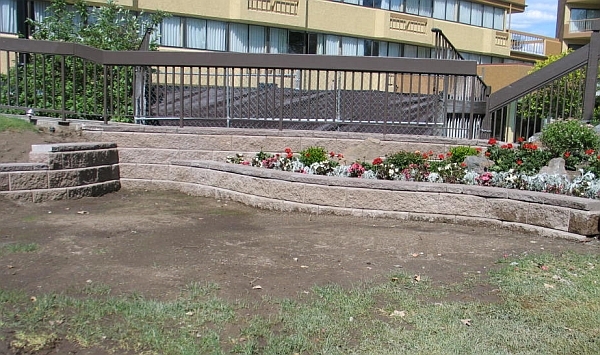 This is at the entrance of the building. 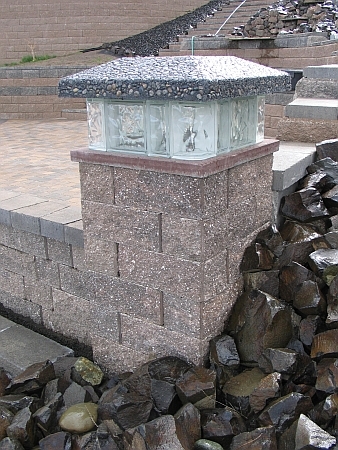 It addresses the rain water run off that is directed to the planter area. 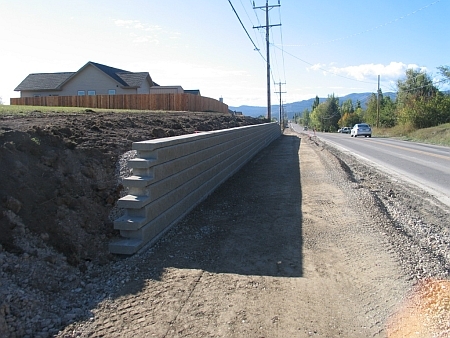 The Allan Block Claasics used on this project was a cost effective answer to a budget problem. 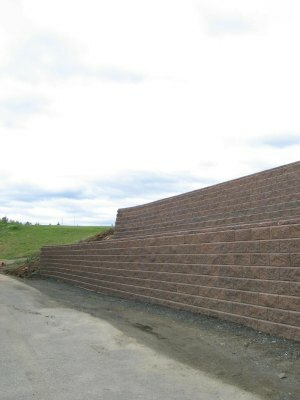 This was both a public and privatly funded project so installed cost was very important. 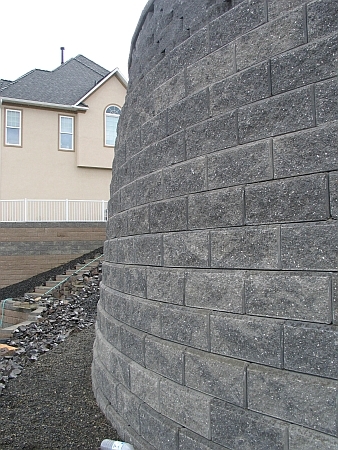 Anderson's Masonry Hearth & Home quoted the Allan Block product against other comparable systems and the Allan Block offered a high quality engineered product as well as a price that helped save money for the project. 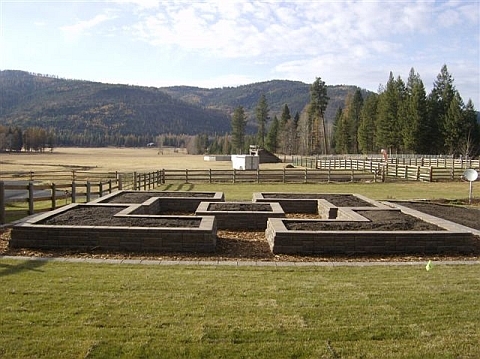 Ben worked witht the homeowner to design a back yard that provided a raised planting space for flowers and plants. 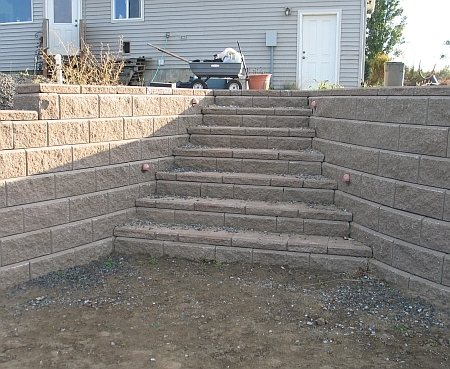 The steps make it easy for the homeowner to access the the planters for maintenance. 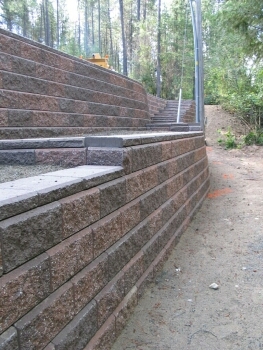 This project used a random mix of the AB Classic and the AB Junior in our Redrock Blend color.